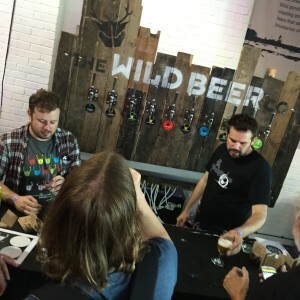 Last week was London Beer Week and I travelled down to attend a couple of events that are seemingly two sides of a beery coin. What I found wasn’t something that close though. No, instead I attended two events that come from two completely different worlds. The first event was CAMRA’s Great British Beer Festival Trade Day at Olympia. This was my third year attending and I found it almost entirely disappointing. I was lucky enough to get a press pass and after picking it up I went into the main hall to catch up with my friends. What I found was an event that felt lazy, out-moded and tired looking. Having hired out such an amazing space as Olympia the organisers have simply plonked everything down just as it was the year before and the year before that, hired the lowest common denominator food vendors and relied on everything staying the same, which now that I come to think of it seems rather in-keeping with CAMRA and the way they want everything in the world of beer to stay the same, to stay how they prescribe it to be. Don’t get me wrong, some of the beer that I drank was well kept and tasted alright, but there was still a vast array of boring bland beer to drink as I wandered around and around the venue looking for something to catch my eye, but all the British beer seemed to blur into one homogenous list alongside, for example, the more interesting European beers – for me, the highlight of the festival yet again – and some good drinking if a little same-y American “Craft” beers. A quick natter with Des De Moor and Adrian Tierney Jones. It was nice to catch up with some people that I’ve not seen for ages, but the overall feel was that of a big room half full of people drearily wandering from one cask ale to the next, simply going through the motions. None of this was helped by this year’s “amusing” logo of a little round man in a pith helmet and khaki safari suit “on the hunt for beer”. The chap they got to dress up in the outfit and wander around the venue peering through binoculars and making witty remarks made the whole thing stink of the worst end of the 1970’s Carry On films. The one consolation was that Tiny Rebel’s Cwtch won Beer of the Festival, which felt like quite a left field choice given the other beer on display during the event. CAMRA are so big, so powerful, that they could easily put on an inspiring and challenging, and above all, interesting event if they so chose. Sadly I fear that for all the lip service paid in recent times about considering Craft Keg and how they may be able to support it, they desperately want everything to stay the same forever. Good presentation makes a big difference. The other event that I attended was London Craft Beer Festival Trade Day. Held in The Oval Space in Bethnal Green, the atmosphere was lively and jovial, a pleasant and compact space to walk around, full of people who were genuinely passionate about the products that were on display. And yes, some of the beer was ridiculous, but you couldn’t fault the playful experimentation and the creative challenges that Brewers had been setting themselves. There was a good mix of beer styles too, from sours to Pale Ales, IPAs to Imperial Stouts. I wandered around the venue happily bumping into people and sampling beer on my way around. The food too, although not on the same level as Birmingham Cubed a month earlier, had been thoughtfully chosen and gave you a choice of well made fayre with which to line your stomach. As I travelled down to the event I wondered what I would be walking in to, and was concerned that I’d find myself in Craft Beard Hipster Hell, but I was pleasantly surprised to find a good mix of people, all ages and sexes, enjoying some really excellent drinks. Matt and Gregg talk shop. 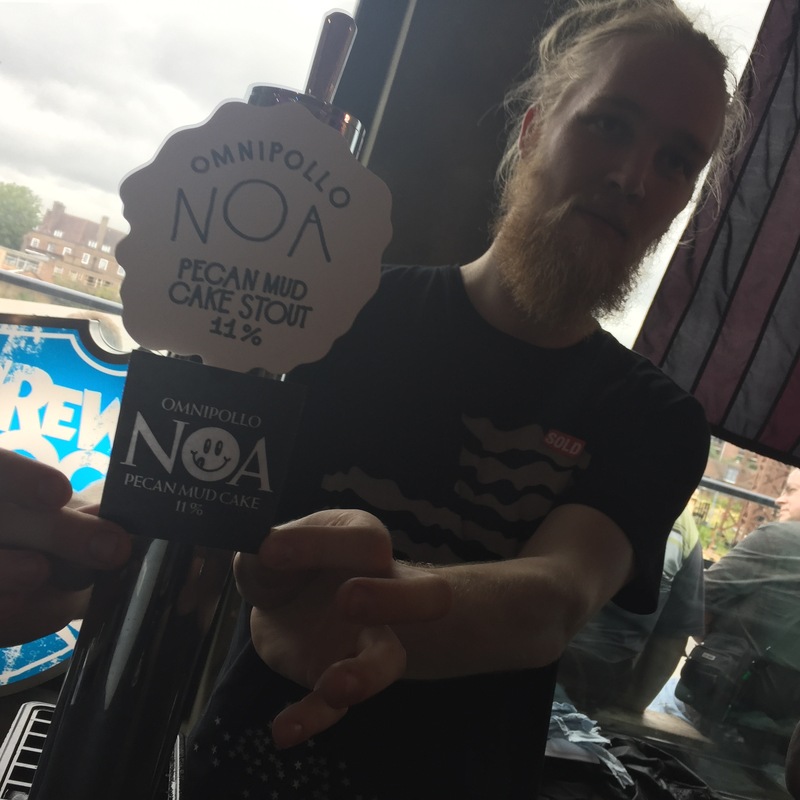 The highlight for me was the beer from Omnipollo, which was all very silly, mixing deep rich Imperial Stouts with pecan and chocolate mud cake flavourings to create the biggest most mouth filling beer I’ve had in ages in their Noa (11%), or even more bizarrely, Magic 90,000 (7%) which is an IPA with blueberry, pecan, almond and vanilla, all brewed with lactose to give a real ice cream sundae feel as you drank. Yes it was silly, but boy was it fun. My only complaint would be that I would like to have seen one or two more of each breweries’ “standard” beers on display – The nearest I came was with Pressure Drop’s super little Pale Ale, Pale Fire (4.8%) – as that would have offset some of the more far-out beers on offer. 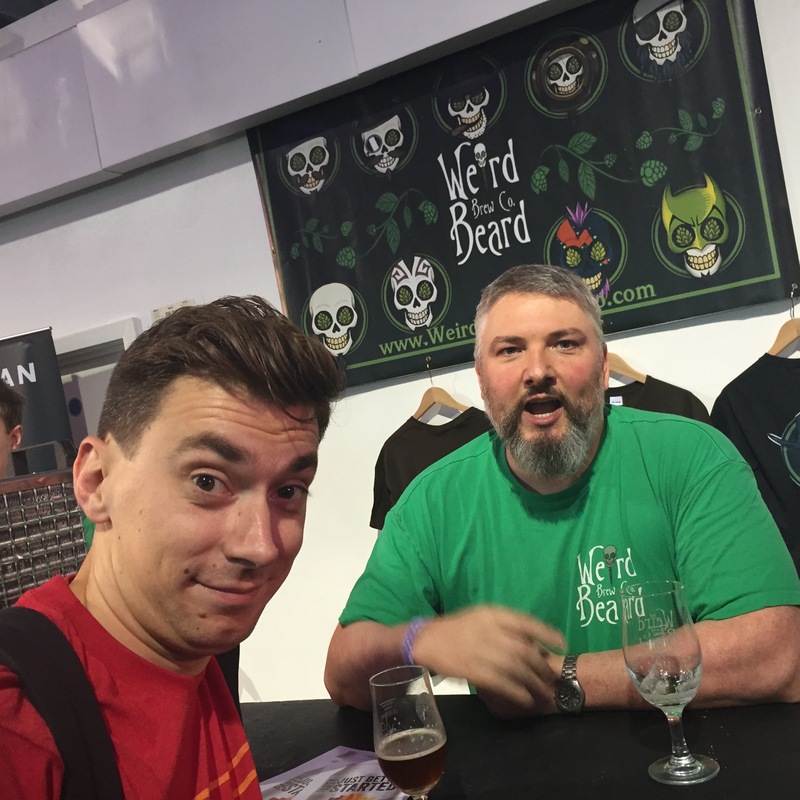 But with all that said, I enjoyed both days, mainly as I caught up with so many old beer chums like Matthew Curtis (@totalcurtis) and Justin Mason (@1970sBOY), and I finally met up with Logan from Beavertown who ribbed me about my terrible review of his Kvas from a few years before. Otto manning the American Bar at GBBF. Pivovar Broumov Opat Grapefruit (4.8%) My beer of the festival. Clean and crisp and juicy. Grain Brewery IPA (6.5%) Disappointing. It felt and tasted slightly off. Deschutes Brewery Pinedrops IPA (6.5%) Bland and uninteresting. Brouwerij De Molen Hel & Verdoemenis BA (10%) Sticky and rich Imperial Stout goodness. Brasserie Cantillon Rosé De Gambrinus (5%) Simply delightful. Arbor Ales Motueka Pale (4%) Well made if a bit boring. Sierra Nevada Hop Hunter IPA (6.2%) A decent Americn IPA, but still not as good as Torpedo. Pressure Drop Brewing Pale Fire (4.8%) Good, clean and crisp pale ale. Omnipollo Leon (6.5%) Decent Pale Ale with earthy Belgian yeast. Wild Beer Co. Einsteinium (4.7%) A lager. A very good lager. Weird Beard Brew Co. Defacer (11.1%) A mental, but brilliant, IPA. Beavertown Moose Fang (8.6%) Double Brown Ale. Nutty and chewy and delicious. Omnipollo Magic #90,000 (7%) Ludicrously good blueberry, pecan, almond and vanilla smoothie IPA. Omnipollo Noa 11%) Pecan Mud Cake Stout. Wowsers. Brew By Numbers 01|06 (5%) Delightful Saison with Motueka and lime. Wild Beer Co. Cool As A Cucumber (2.9%) Delicate and lovely. Kernel IPA Simcoe (7.1%) The Kernel still rock when it comes to IPA’s. Founders Brewing Co. Breakfast Stout (8.3%) Very good coffee Stout. Buxton Brewery Yellow Belly Sundae (12%) Milk Stout version of the amazing Yellow Belly. Brew By Numbers Pi|02 (6.5%) Barrel aged Saison with Brettanomyces and grapes. Sound good? It was. Weird Beard Brew Co. Duke Of Dank (6.7%) Big hoppy Red Ale. Partisan Brewing Raspberry Lemon Saison (3.6%) Tart and fresh. Edge Brewing Co. Padrino Porter (6.9%) More like a decent Black IPA. Omnipollo Magic #4:21 (6%) Double Raspberry Vanilla Smoothie IPA. Ridiculously good fun. This entry was posted in Beer Events, Beer Review, Beer Travels, CAMRA, CAMRGB and tagged 7.5% +, Amber Ale, American, Barrel Aged, Beer, Beer Review, Belgian, Bitter, Black IPA, Blonde, Brewery, CAMRGB, Can, Craft, Craft Beer, Double IPA, Drinking, Fruit beer, German, Golden Ale, Great British Beer Festival 2015, Imperial Stout, IPA, Lager, Lambic, London Beer Week, London Craft Beer Festival, Pale Ale, Porter, Real Ale, Red Ale, Saison, Stout. Bookmark the permalink. Everything you say about the Great British Beer Festival is true; which is why I didn’t go this year, or the year before, for that matter. I really didn’t enjoy the one before that either (2013); same tired format, too many samey beers and far too many people! Unfortunately, I couldn’t make it to London Craft Beer Festival, which would have been my festival of choice. There’s always next year, though! Hi Paul, and thanks for the positive comment. The beers you drank at GBBF were these range of styles, what’s your problem with the beer selection? That you didn’t want to drink all of the beers on offer? Not bizarre, because in order to drink imperial stouts and sours at GBBF I had to go to the European bar and buy old classics like Cantillon in a bottle, whereas at LCBF I could try new sour and imperial stouts (for example) from new and exciting English/British brewers. 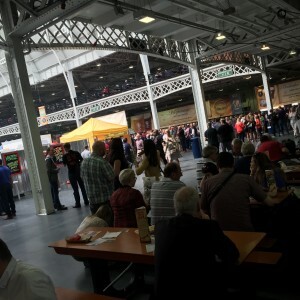 GBBF, after all, is the Great BRITISH Beer Festival, and yet to experience something that’s not the same old thing you need to go to the foreign bars. Why would you go to a beer festival and order “old classics like Cantillon in a bottle”? How do you know all the beer was boring when you didn’t drink any of it? Firstly, I did drink some of it as I tried beer that friends had bought. We tend to swap and share as we go around, and the mouthfuls of beer I tried were in the main Golden Ale between 3.9 and 4.2% and all tasted the same, ie like Golden Ale. I bought the Cantillon as a palate cleanser. And before you say anything, I am open about my dislike of the Golden Ale style of beer, I find it very very boring, but finding any of the other beers on offer as mentioned in a comment above was very difficult when they’re buried so deeply amongst rows and rows of this bland golden ale. Mind you, all of this is simply my opinion and you and everyone else are more than welcome to disagree with me, which I guess you already do. I went to the GBBF a couple of times last week. There were a couple of good beers on the British cask selection (there was a chocolate vanilla imperial porter called Itzamna which was nice) and at last I got to sample some beers from the American cask bar; they had a good soured barrel aged stout (Crazy Ivan) and a few nice IPAs but the latter I felt could have done with being cooler. On the Saturday, anything worth trying had all but vanished from the British casks so I just sat by the continental bar all day machining through some excellent beers from European craft brewers – Rasputin by De Molen, Permon’s Angry Beer IPA, Het Uijlte’s Schreeeuil and an Elderflower Hefeweizen from Pivovar Antos. This in itself made me a bit cross. It’s probably a point you hear a lot but why is a kegged craft beer from the Netherlands allowed but one from Buxton or Siren in the UK not? If kegged beer is unacceptable from the UK, shouldn’t they apply that stance to the European brewers as well? In their hypocritical attitude, as you rightly say CAMRA is depriving itself of some of the best and most innovative brewers in the country. In my opinion, an event called the Great British Beer festival should showcase the best beer in the UK. Sadly for the past few years it has not done this. Orange Wheat Beer, a Cherry Stout, a Vanilla Pod Imperial Porter, a Rye Bitter, a White Chocolate Wheat Beer, a Port enhanced Mild, a Bourbon Stout, a Lemongrass & Ginger pale ale… shall I go on? GBBF was bursting with innovative and creative ales. All of the above and more were available to you on the British Bars, to say that those bars blurred into one is a bit unfair. Not when hidden within the weight of Golden Ales, compounded by the fact that the whole set up of the “festival” (I find nothing festive, celebratory about GBBF) makes me lose the will to look for anything, which is why I (and a lot of other beer writers and professionals) ended up at either the European or American bars. I couldn’t agree more with every word you say. Even more than two years ago when I went to both events, I found GBBF dull and uninspiring and LCBF stuffed with exciting and challenging beers, with the stalls run by enthusiasts eager to talk about their beers. Unfortunately there seems to be no incentive for Camra to radically rethink Olympia. The lack of information and access to the brewers themselves is very frustrating at the GBBF. The irony is that since the craft beer movement took off a few years ago it’s CAMRA people, the erstwhile rebels, who have become mainstream, comfortable, and “boring”. Beers for GBBF are selected by people who know what they like, and basically they like cardigans (but not ironic cardigans). I don’t know how the new-wave beards select the beers for their bashes, but I suspect that pure silliness and an urge to give the old-wave beards a good sharp tug have something to do with it. At some point the two must meet and a synthesis will occur, but until it does I’m afraid that GBBF is too dull for me, but the Pointy Shoes Electric Soup Carnival or whatever it’s called is just too exciting. Decided to leave CAMRA this year for a variety of reasons. If they are losing middle-ages cask beer types like me then they really are in trouble. I’ve been saying the very same thing about GBBF for a few years. The reaction ranges from disinterest to hostility. It’s a bit of a shame after all the great work that CAMRA have done in ensuring that we don’t lose great traditions of both brewing and drinking good beer has kind of plateaued and stalled. I too think they are far too happy with how things are, and will continue to put together very average festivals. I still find their attitudes towards keg beer archaic and counter-productive, as there is some simply mind-blowingly great beer out there that deserves all the praise it can get, and yet is sneered at and still not considered ‘proper beer’. I was, however, pleasantly surprised that Cwtch won beer of the year. Having had some very recently, I can agree that it’s a good pint, and at least it wasn’t Timmy Taylors Landlord, or Boltmaker, or Turdmender that won. Sounds like a terrible death metal band from Dudley. Is there actually a place called Dudley? Well I never. It has been 5 years since my last visit to GBBF (and having been in prior years) and while I liked Olympia I did also find this year to be a little disappointing, but not necessarily for the same reasons you list. I live in the US and GBBF in the past was always a way to reconnect with some of the best British ales in the country and then take a break with a few international offerings. This year major breweries were woefully under represented – Brakespeare, Batemans, and even Greene King had only one relatively mundane offering. In their place was a slew of pales, bitters and IPAs that became monotonous. Even the international section seemed lacking this time. I know that “craft beer” using new exciting hop varieties and adjuncts is the hip thing these days but we get that in spades across the pond. Unfortunately while it seems that is what more people in the UK want as well, I believe that movement is chipping away at traditional British styles. We met up with a well known London based blogger who dragged us around to several pubs, most of which focused on beers that tasted like many in the US, often using American hops etc. His intentions were good, but that was not what I was after. It would be analogous to taking a Brit to US bars that only served bitters or German out for a pub crawl of the best places with pilsners. Again, this is only one point of view from someone that relishes traditional styles and their subtle nuances and I know tastes change, but I hope the new craft craze doesn’t seriously impact traditional real ale more than it already has. Cheers. It’s really interesting to get a different take on the whole thing. Good to meet you at last, Simon, if only briefly. Sounds like it might have been one of the highlights of your GBBF! I don’t think my judgement is as harsh as yours, but I do share some of your sentiments. When I wrote up GBBF a few years back I remarked on how the dynamism of the Bières sans Frontières (BSF) bars shows up the lack of excitement in the UK cask selection, and that was before the surge of creativity in the UK brewing scene had really taken hold. I think the problem isn’t primarily cask orthodoxy, although you’re right that if the Great British Beer Festival were truly representative of Great British Beer, it wouldn’t just serve cask (and don’t get me started on the lack of a UK bottle conditioned bar this year!). It’s that there’s no controlling intelligence behind the selection and the way it’s presented. Similarly to the GBG, there’s an elaborate system of branches putting forward beers, and a lot of politics about what gets poured and what doesn’t. Even the beers stocked at the brewery bars have to go through the CAMRA ordering process. It’s the classic “doing things by committee” where everyone ends up playing safe. Whereas ordering for the BSF bars is done by knowledgeable specialists who take more of a global view and make an effort to present interesting and representative stuff. 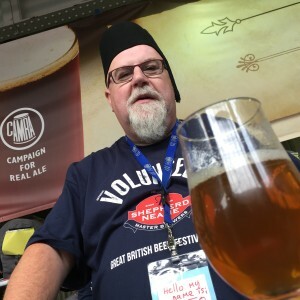 It’s phenomenal that an event on the scale of GBBF is put together and delivered almost exclusively by volunteers, but the downside is the way the old school bureaucratic governance is embedded at every level. Really it ought to be delegated to a small group who know what they’re doing, and have clear guidelines to represent the very best and most interesting of British brewing with a selection that balances traditional and innovative. One thing I’d love to see is fewer breweries, and more beers from each. I wouldn’t want to see all hop bombs and way-out Impy stouts: well-balanced and well-flavoured session cask beers are a near-unique speciality of British brewers and there should still be a place for them, but I’d rather see a few more best bitters and milds from family brewers and fewer insipid golden ales from uninspired micros. The other point you quite rightly make is the lack of brewers behind the bars. Nothing wrong with volunteers staffing the bars but on the BSF bars they tend to be enthusiasts who know the beers well and can give good advice, whereas on the UK cask bars they just seem to be allocated at random. And the ludicrous alphabetical-by-county arrangement means they’re not even encouraged to specialise regionally. Actually I thought things were a bit better this year than previous years on the UK bars, a few more interesting beers, and while some of the implementation was naff, the beer explorer thing and the overall branding were good ideas and better than before. 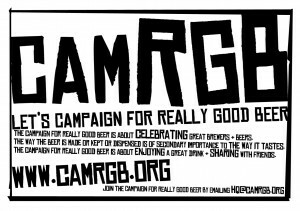 In an ideal world I’d hope CAMRA would act on the realisation that it no longer has the monopoly on beer appreciation, and take a long hard look at what’s going on with the competition, at events like the Craft Beer Fest and Indy Man. It was indeed a pleasure to meet up, albeit briefly and I look forward to sitting down for a pint and a natter in the near future. Thanks for your wonderful response to my article, you’re absolutely right. 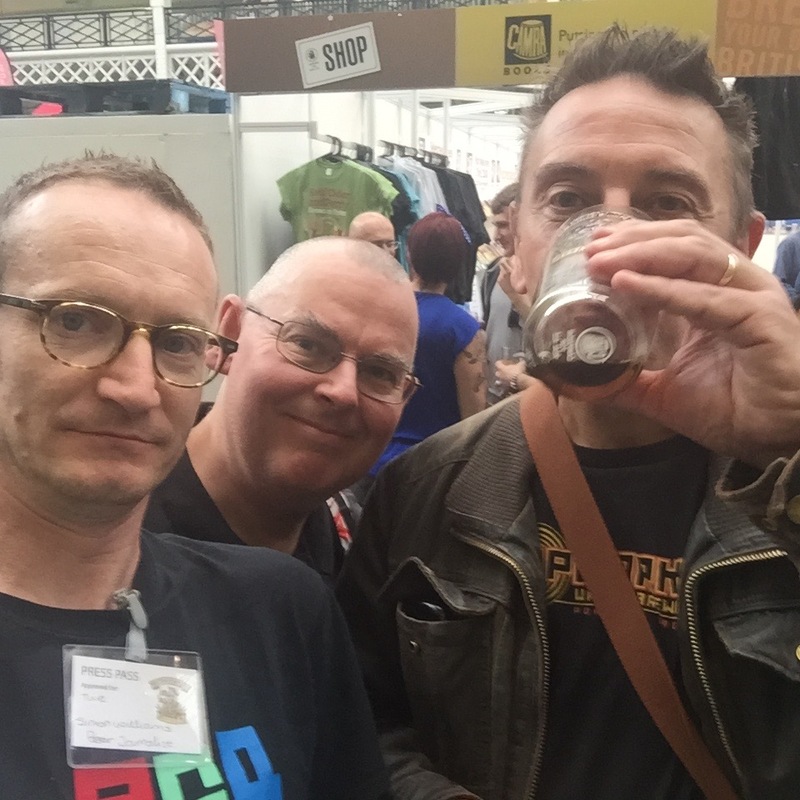 I hold no brief for the GBBF – never been – but if the interesting beer was there but you couldn’t be bothered to look for it, I’m not sure that’s their fault! Also, under LCBF you list 18 beers with an average strength of just under 8%! How small were those measures? I’m interested, because I have come across beers (well, a beer) that tasted palate-bustingly amazing for a couple of mouthfuls but rapidly became a struggle after that; getting through the third took me a quarter of an hour, and I was glad to get it finished. Even the most extreme beers at GBBF are never going to be that kind of amazing – the pint-drinking culture runs deep. Firstly, I did go looking, but under the weight of mediocrity anything interesting was incredibly hard to find, and in the end we gave up and headed for the European and American bars, as did so many other writers and brewers etc. Secondly, on entering LCBF you are given a 3rd measure glass, though most of the really big beers that I tried, I had half of that as I was aware that I had to get back across London to my train. Fair enough – reminds me of a SIBA festival I went to once, where I ended up just walking up and down the rows of pumps looking for anything that wasn’t a bitter, or failing that anything using a san serif font and no graphics. I did a lot of walking.